Many parents and students we've spoken to feel confused and overwhelmed by the amount of conflicting, misleading, and even blatantly false information available on the US college system. So we decided to make our ebook, College Uncensored. 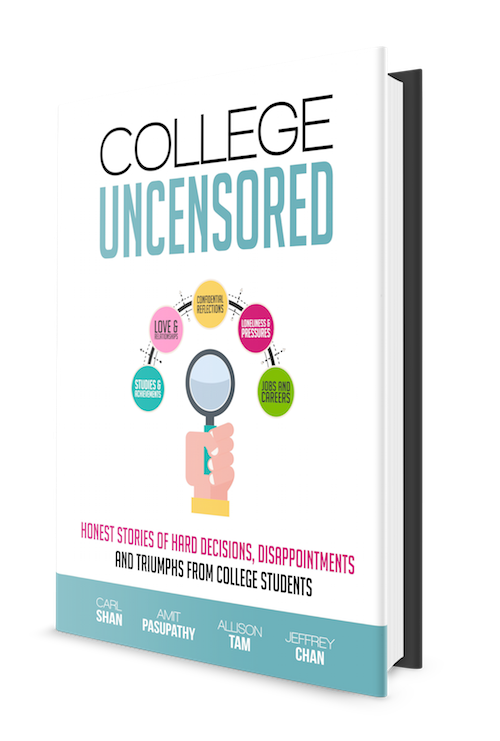 College Uncensored contains 11 in-depth interviews with college students from diverse backgrounds, who can share their perspective and wisdom. Books like these typically cost between $10 - $20. However, we're leaving how much to pay up to you (including FREE). We're doing this because the knowledge contained is too important not to share. All that we ask is that you pay a fair amount. This book curates 11 in-depth interviews with students sharing their honest stories, reflections, and opinions on their college experience. It has interviews with students who took unconventional paths to college, made bold decisions, and who want share their thoughtful perspectives with others. You are a high school student who is interested in learning about what college is really like. You are a parent who would like to better understand US colleges and universities. You are a college student looking to transfer to another university. This book can give you a glimpse at what other campuses are like. What colleges are represented in this book? This book covers a diversity of life paths. We interviewed students who attend well-known universities, as well as those who chose to take different paths at lesser-known institutions. But regardless of the specific college our interviewees attend, each of them have shown immense wisdom in sharing their decision-making process. Since our #1 goal is to get the stories of the students we interviewed into the hands of as many people as possible, we are leaving how much to pay for the book up to you. You can get the book for FREE, but we encourage a fair price of $10 for the amount of time and energy we put into making this book.